CAIRO – Sharemarket transactions in Egypt are set to become more expensive, as the government comes closer to implementing its long-debated stock stamp tax. Over the course of this week the Cabinet of Egypt is expected to receive the proposed legislation for a new stamp tax to be applied on stock market transactions. It is currently expected that the tax would be levied at a rate of 0.125 percent on any transaction on the stock market, rising to a rate of 0.15 percent in its second year of operation, and 0.175 percent in its second year of operations. Based on the number and size of transactions seen on the stock market presently, the tax could raise as much as EGP 1 billion per year. GENEVA – The pan-EU transaction tax may still be enacted, despite having lost momentum since its proposal nearly 5 years ago. The long-debated and highly controversial plan to implement a multinational transaction tax in Europe is “within reach” according to the European Commissioner for Economic and Financial Affairs, Taxation and Customs Pierre Moscovici. 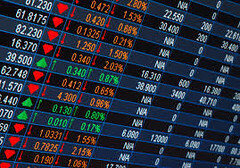 The proposed tax would see all financial transactions conducted in participating countries taxed at 0.1 percent, if the transaction involves stocks, and 0.01 percent if the transaction involves derivatives. The tax was first proposed in 2012, in an effort to raise funds and address the issues which are believed to have caused the global financial crisis in 2008. BRASILIA – The government of Brazil is cutting the tax obligations faced by business receiving foreign loans, opening the door to more financing opportunities, while helping address the problem of the falling value of the national currency. In a statement issued on June 5th the Ministry of Finance of Brazil announced that in order to help stabilize value of the national currency and to help small business to obtain new financing and credit options, the currently enacted transaction tax on obtaining international loans would be scaled back to exclude short term loans. The tax, locally referred to as the IOF, was previously applied at a rate of 6 percent on the value of any international loan with a maturity of longer than six month, however, the threshold has now been raised to one year. BRUSSELS – Work is continue on the implementation of a financial transaction tax in Europe, and an amicable conclusion may be reached by the end of the year. While speaking to the press on May 5th the Minister of Finance of Germany Wolfgang Schaeuble indicated that a joint conclusion may soon be reached by all involved parties in the discussion over the long-standing proposal to implement a financial transaction tax in 11 European countries. According to Wolfgang Schaeuble, representatives of all 11 participating countries are currently continuing negotiations to decide on an outline for implementation of the tax within days, with an aim to come to an agreement on the final details of the tax by the end of the year. KINGSTON – Strong opposition has arisen in Jamaica to a newly proposed tax on withdrawals from ATMs and banks. Over the last week several professional groups and politicians in Jamaica have come forward to voice their stern opposition to a new government proposal to tax all withdrawals from financial institutions, including cash withdrawals from ATMs, with some groups even going so far as to call on the government to drop the proposal entirely. The government is currently proposing that all financial transactions and encashments of up to JMD 1 million should be subject to a 0.1 percent tax to be paid by the financial institution, a measure which could raise as much as much as JMD 2.25 billion per year.